Eleven players showed up for yesterday's game/90 quads in Mount Arlington. Instead of quads, there were two Swiss sections, of six players and five players respectively. I finished with a score of 1-0-2 in section one. Here is my drawn game from the second round. 51.b5 Na4 52.Be8 Nb6 53.Bf7 Kf6 54.Kxf4 Kxf7 55.Kxf5, draw. In the April-June 2009 issue of Atlantic Chess News, my article on double bishop sacrifices can be found on page 17. Ken Calitri's interview with Jennifer Shahade runs from pages 18 through 20. The DOCA TransNet FIDE Invitational concluded with these games from the ninth round, including NM David Grasso's victory against me for which Grasso was awarded the Best Game prize. Ziping Liu is featured in a recent post by chess blogger Diamondback. The above photo, taken by me last Sunday at the Westfield quads, shows Ziping on the right next to his father, as they stand in line behind Alice Dong and Sameer Mujumdar. Playing in quad five, Ziping finished with a score of 2-1-0, bringing his unofficial USCF rating to 1745. The Philadelphia Inventors of the U.S. Chess League have selected Rahul Swaminathan and Kavinayan Sivakumar as members of their team. These games from the eighth round began the last day of the DOCA TransNet FIDE Invitational. The Marshall Chess Club presents free Tuesday chess classes for adult players who are members ($10 for non-members). This series is based on The Mammoth Book of the World's Greatest Chess Games. Tonight's class, starting at 7pm, is being taught by FIDE master Asa Hoffmann, sparring partner of champions and author of the highly regarded Chess Gladiator. The games being analyzed are Reti - Alekhine, Baden Baden 1925 and Rubinstein - Alekhine, Semmering 1926. Pictured above are the other three participants, besides myself, in quad one yesterday at Westfield. Standing is Kavinayan Sivakumar, as he watches Sameer Mujumdar defend against Richard Blank. Here is my victory from the last round. 13.fxe6 fxe6 14.Nf5 Bd8 15.Qg3 Bc8 16.Bxc5 Qxc5+ 17.Kh1 Nh5 18.Nh6+, Black resigns. I was lucky to draw this game at yesterday's quads in Hamilton. There were 3 seconds left on my clock when I reached the first time control of 40/80. 30.Re2 Bxe3 31.Rge1 Rfe8 32.Rxe3 Bxg2+ 33.Qxg2 Qd7 34.Rxe8 Rxe8 35.Rxe8 Qxe8 36.Kh2 Qc8 37.Qd2 Qc5 38.Kg2 Kh7 39.Kh2 Qf5 40.Kg2 Qc5, draw. At Contre Gambit Philidor, Frederic Fournier provides a link to two of my games in the Philidor Counter Gambit. 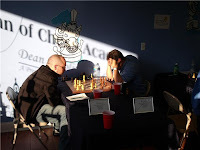 The battle between NM David Grasso and IM Dean Ippolito, shown above, is just one game from the seventh round of the DOCA TransNet FIDE Invitational. 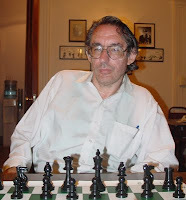 At Jim West Talks Chess, I have posted my draw against NM Arthur Feuerstein [pictured above] from round two of the DOCA TransNet FIDE Invitational. The game opened with the Fajarowicz variation in the Budapest defense. In about 4 to 6 weeks, the Dean of Chess Academy will be moving to the ShopRite Plaza on Route 22 in Branchburg NJ. The new building will be three times the size of the current one. This will enable DOCA to have more FIDE rated events, in addition to its league on Wednesday and Friday nights. The following games were played in the sixth round of the DOCA TransNet FIDE Invitational. FIDE has just rated the DOCA TransNet FIDE Invitational. Here are the expected first ratings for the four players who were not FIDE rated at the start of the tournament. During yesterday's game/45 Swiss at the Marshall Chess Club, I took these pictures. Before the tournament, chess teacher Tag Taghian gives a lesson to one of his students. NM Raven Sturt plays speed chess, while Eigen Wang stands watching. FM Boris Privman reads the newspaper. FM Ilye Figler chats with Privman. Here is play from round three. This photo shows more games from the third round. In round three, IM Jay Bonin is held to a draw by Eigen Wang. Between rounds, a chess player and his father eat lunch in the rear courtyard. Chess blogger John MacArthur is shown here before he defeated me in round four. FM Ilye Figler and NM Raven Sturt prepare for their fifth round encounter, won by Figler who tied for first place at 4 points with Luis Sanz Arilla sitting to the right of Sturt. Playing in today's game/45 Swiss at the Marshall Chess Club, I finished with a score of 2-2-1. Here are a couple of games featuring the Philidor Counter Gambit. 35.Qe1 Bxf2+ 36.Qxf2 Qxf2+ 37.Kxf2 Bxg2 38.Kxg2 a5 39.h4 a4 40.g4 a3 41.h5 a2 42.g5 a1=Q 43.h6 gxh6 44.gxh6 e4, White resigns. 27.Rxe7 dxc3+ 28.Kxc3 Kxe7 29.f3 Bf2 30.h5 Bg3 31.b3 Kd6 32.a4 b5 33.Bf5 bxa4, draw. The second weekend of the DOCA TransNet FIDE Invitational began with these games from the fifth round. Last Sunday, Ziping Liu won quad four at Westfield with a score of 2-0-1. Here is his victory in the second round. Fritz8 evaluates the position after 27.Bxc3 as equal. 23.Nxa4 Qxb5 24.Qxb5 Rxb5 25.Be1 Ra8 26.Nc3 Bxc3 27.Bxc3, and 0-1 in ? moves. 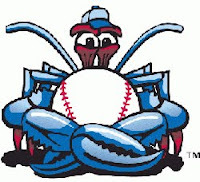 It was Chess Night on August 3rd at the baseball game of the minor league Lakewood BlueClaws. Take a look at the games from the fourth round of the DOCA TransNet FIDE Invitational. Over the weekend, Susan Polgar and Paul Truong were voted out of the U.S. Chess Federation. Earlier today, I played this drawn game at the Marshall Chess Club. 63.a5 h4 64.a6 Bd4 65.Kh3 Kg5 66.Bc6 Bc5 67.Bd7 Bb6 68.Bg4 Bc5 69.Kg2 Kf4 70.Bc8 Bb6 71.Bg4 Bc5 72.Kf1 h3, draw. At the Viking 4-County Open 2009, which I won on tie breaks, I found myself playing against a variation that I have tried from both sides of the board. In my games as Black, I usually arrive at this position via the Philidor Counter Gambit move order 1.e4 e5 2.Nf3 d6 3.Nc3 f5 4.d3. In the game Carlsen-Dolmatov, Aeroflot 2004, the same position occurred from a Dutch formation after the opening moves 1.Nf3 f5 2.d3 d6 3.e4 e5 4.Nc3. This is the move that I have preferred. Dolmatov got into trouble after 4...Nc6 5.exf5 Bxf5 6.d4 Nxd4 7.Nxd4 exd4 8.Qxd4 Nf6 9.Bc4 c6 10.Bg5 b5 11.Bb3 Be7 12.O-O-O Qd7 13.Rhe1 Kd8 14.Rxe7 Qxe7 15.Qf4 Bd7 16.Ne4 d5 17.Nxf6 h6 18.Bh4 g5 19.Qd4, Black resigns. In my opinion, Black's knight is misplaced on c6, a square that should be occupied by his c-pawn. The rule of thumb in the PCG is that Black should only develop the queen knight on c6 after White has played the king bishop to c4, when White loses a tempo if he pins the knight by moving the bishop from c4 to b5. With the bishop on c4, Black's knight often attacks it from the a5 square. Black throws away a valuable tempo by this inaccuracy. The one drawback to White's 3.d3 is that he will be down a tempo, compared with normal lines in the PCG, after an eventual pawn push to d4. Now White is allowed to regain the tempo. In a game from October 2006, where I was White against Adam Levine-Weinberg (USCF 1741) at the Marshall Chess Club, Black varied with 8...f4 9.Be2 Be6 10.g3 fxg3 11.hxg3 Nd4 12.Rdf1 b5 13.Bxf6 Nxf3 14.Bxf3 Rxf6 15.Bg2 c6 16.Bh3 Qd7 17.Bxe6+ Qxe6 18.f4 Raf8 19.f5 with a clear advantage for White who won in 33 moves. White has a clear advantage here. Now the best attempt for Black would have been 15...Qd7 16.Re6 Ng8. Instead his next move is a blunder. I missed a stronger continuation by 17.Qh4! Re8 18.Nd5 Nxd5 19.Bxd8 Raxd8 20.Qa4 Ra8 21.Qb3 Nb6 22.Kc1 with a winning advantage. Black should have tried to hang on by 17...Rf5!? 18.Bxe7 Rxd5 19.Qxd5 Qxe7 20.Qxb7 Qd8 although White is clearly better with an extra pawn. White is winning, but play is still tricky. Objectively speaking, I should now have played 32.b3 which maintains White's win. But with time trouble looming for both players, I was worried about exposing my king. White stays on top after 33...Rd3 34.Qxc4 Qxc4+ 35.Nxc4 Rh3 36.Nd6 Rxh4 37.Bxg7+!. After 42...Re8 43.Nxc4 Qg6 44.Nd6 Rd8 45.Be5 h5, Black has good drawing chances. With little more than a minute left on his clock, Black makes a fatal error. On 43...Qf8, White decides the game by 44.Ne7+. On Tuesday, August 11th, GM-elect Alex Lenderman will lecture at the Marshall Chess Club on one of his recent games in which he won his final grandmaster norm. The lecture will begin at 7p.m. and is open to the public. These games were played in the third round of the DOCA TransNet FIDE Invitational. 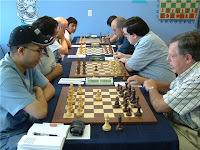 On Sunday, I took these pictures at the Marshall Chess Club during the game/30 tournament. NM Raven Sturt prepares for round one. FM Asa Hoffmann, not participating in the event, is a spectator. This shot from round two shows Michael Layevskiy and Asa Hoffmann standing while NM Yefim Treger defeats Mitch Fitzko, Yevgeni Margulis loses to NM Parker Zhao, and IM Jay Bonin beats Sam Barsky. FM Brian Hulse leans against the wall. In round three, Eric Bobrow fails against Gabor Schnitzler. Meanwhile, in the left background, GM Michael Rohde is held to a draw by NM Parker Zhao. Larry Price watches NM Yefim Treger lose to GM Michael Rohde, in round four.